As I was out walking today, I really wanted it to feel like Spring, however there are still too many signs of Winter. (See the picture at right) The wind was making it feel a little chillier than the thermometer reading, the snow pack in yards is still very prevalent and snow banks in some spots are still 4 feet tall where the plows have deposited the snow. 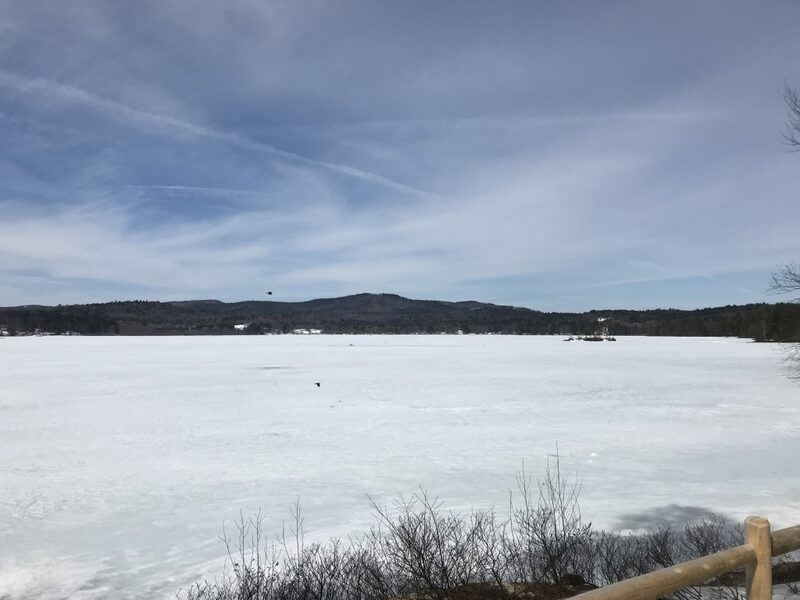 However, bob houses have disappeared from the lake (April 1st is the deadline for them to be off), no snowmobiles or other motorized vehicles are traveling on the lake and some bare spots on the ground are showing where the higher March sun hits directly. The shoreline ice is thinning and little bits of water are starting to show, but with 24+ inches of ice out there, I don’t think “Ice Out” will be happening soon! But April 1st is right around the corner and hopefully that means higher temperatures which will make water and green grass appear. As we start to see the sun sparkle on the lake again along with the reflections of mountains and trees in its mirror surface, we must remember to be great stewards of our lake. I received the Volunteer Lake Assessment Program report last week. Data is gathered each summer by our volunteer lake testers and this data is compiled by DES. Although lake phosphorus and algal growth remains within a good range, we must continue to monitor the nutrient loading into the lake. Please refrain from the use of fertilizers on your lawn, maintain your septic system and look for ways to improve the storm water run off on your property. You may also have read or heard about the dangers of using the product Roundup on your lawns. Evidence is showing this to be a human health risk as well as harmful to our lakes due to harmful chemicals entering the lake through storm water run off. Be mindful of your usage. Another way we take care of our lake is through the Lake Host Program. Our application for grant money to pay our Lake Hosts has been submitted. We now need to recruit people to serve as Lake Hosts. Last summer we had one Lake Host. She was a college student who worked weekends until she had to return to school. That left us with some unmanned shifts in mid-August to Labor Day. It would be great to have 3 Lake Hosts this year. We could spread the shifts out so one person would not have the full burden. The shifts will be 7:00am – 4:00pm on Saturdays and Sundays from Memorial Day weekend until Labor Day. A host could take a morning shift on Saturday or Sunday or an all day shift either day. The pay is $11.00 an hour. If you volunteer your time, that gets counted toward our match of the payroll funds. Thus the more interested parties the better. A lake host would have to attend a 2 hour training session prior to the beginning of the season. Krystal Alpers and Deb Steadman are our Coordinators for this year. If you would like to be a part of this program that helps insure the health of our lake, please contact them. Krystal’s email is kalpers@franklinnh.org and Deb’s email is dsteadman@metrocast.net. Thank you for giving this some thought. The WLA sponsors many fun events during the summer. As you think about returning to your little piece of paradise, give some thought to helping with some of these activities. Let me know if you would be interested in helping with Breakfast on the Beach, Boat Parade, Yard Sale or Ice Cream Social/Food drive. Maybe you have a new suggestion for the WLA. We are open to new ideas and volunteers.